Every now and then, I come across a book that absolutely knocks my socks off. I’m talking about the kind of book that jumps immediately into your top favorites, possibly even dislodging a few books from favored status and knocking them down a peg. This is the kind of book that makes you re-evaluate your entire hierarchy for judging books… it’s the kind of book you can’t get out of your head. It’s the kind of book you just HAVE to share with someone immediately, because you feel that everyone needs to read this story! I like a lot of books. I LOVE a lot of books. But these kinds of books, the ones that steal your heart… these kinds of books are something special. Such was the case with Joey: How a Blind Rescue Horse Helped Others Learn to See by Jennifer Marshall Bleakley. Joey is a story about an actual place in Raleigh, NC called “Hope Reins.” It is a ranch that uses horses to bring healing to hurting people. 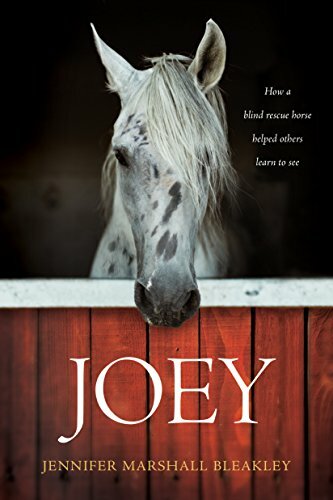 “Joey” is the true story about the woman whose dream it was to open this ranch, the journey God led her on, and the blind rescue horse who touched the lives of so many people around him. This book is masterfully woven and put together, and the story itself is absolutely beautiful. The people in the book will step out of the pages and become real to you as you read their stories and fall in love with Joey and Hope Reins along with them. I know that my “brand” is fantasy. And usually I stick to that here on my blog when it comes to reviews, even though I do actually read other genres upon occasion *wink* but I’m making an exception for Joey, because this book is exceptional. This book reminded me that God works in mysterious ways. It reminded me that His calling isn’t always the easiest or smoothest route to follow… but that if He calls and we follow, He will faithfully work out the details. Trust. Trust is the theme of this book. And as Joey learned to Trust the staff at Hope Reins… he taught them to Trust the One who created each of them and set them where they were so that they could impact one another and reach out beyond their own capabilities with comfort, understanding, and healing for hurting hearts in ways they never could have accomplished by themselves. I read Joey in a single day… I stayed up late reading on vacation because I absolutely could not put it down… even when the pages got a bit too blurry to read… *grin* This is a story I cannot recommend highly enough. But make sure you have a dozen boxes of tissues nearby when you grab this one, because you’re gonna need ‘em! I’d give it Six Dragon Eggs if I had a graphic for them!!! Thank you for handing this book to me right before I had to say goodbye to you and your family for my 5.5-hour flight home. I read it ALL the way and got to chapter 16 (out of 24). I was glad the plane cabin was dark because I did not have a box of tissues handy and I really did need them for chapter 16! Yesterday, I finished reading Joey and immediately went back to the beginning to read with new understanding and new “insight” and I couldn’t resist penciling in some underlining for parts that were just too poignant to leave unmarked! I’m so glad you enjoyed it!!! !